Unlike many of the existing rapid prototyping (RP) methods, the LENS technology uses metal powders to create functional parts that can be used in very demanding applications. 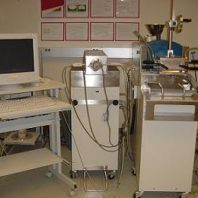 The process uses a 500 W of Nd:YAG laser power focused onto a metal substrate to create a molten puddle on the substrate surface. Metal powder is then injected into the molten puddle to increase the material volume. The substrate is then scanned relative to the deposition apparatus to write lines of the metal with a finite width and thickness. Rastering of the part back and forth to create a pattern and fill where material is required allows a layer of material to be deposited. Finally, this procedure is repeated many times until the entire object represented in the three-dimensional CAD model is produced on the machine. In this fashion, a part is built up from powders that is fully dense. 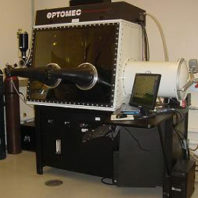 We have used our LENS machine to create parts made of Ti, Ti-6AL-4V, Ni, steels, and their composites. 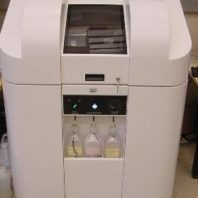 The ExOne (Ex One Company, Irwin, PA) three-dimensional (3D) printer creates 3D ceramic objects by selectively applying a liquid binder to a loose powder. In this printer, components are built up layer by layer in an iterative process. First, a layer of powder is spread. 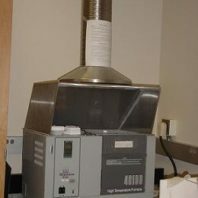 Then a printhead with binder jets is moved across the powder under computer control to selectively bind the powder together where positive geometric features are desired. The part is lowered, and a new layer of powder is spread over the top. The process is then repeated until the entire geometry is complete. This temporarily builds the part until it can be dried and sintered to the specific density. Fused deposition modeling (FDM) is one of the most popular commercial rapid prototyping (RP) systems in the world. 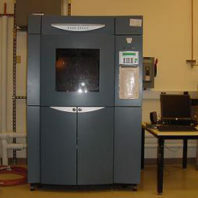 The fused deposition process, commercialized by StratasysTM Inc. (Eden Prairie, MN) as Fused Deposition Modeling (FDMTM) is one of the commercially available RP processes. In this process, a thermoplastic polymer filament passes through a heated liquifier, where the liquifier is heated to slightly above the melting point of the polymer. The liquifier extrudes a continuous bead, or road, of material through a nozzle and deposits it on a fixtureless platform. The liquifier movement is computer controlled along the X and Y directions, based on the build strategy of the part to be manufactured. When deposition of the first layer is completed, the fixtureless platform indexes down, and the second layer is built on top of the first layer. This process continues until the part manufacture is completed. The temperatures of the liquifier and surrounding environment, as well as filament feed rate and nozzle diameter, are some of the important variables that determine the quality of the final part. Using our FDM set-up, we can build parts with wax (ICW-06), ABS, Polycarbonate, and Polyphenylsulfone materials. 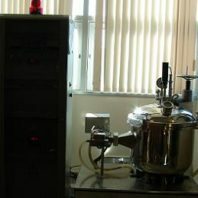 Micromeretics Inc. Our BET surface area measurement unit measures surface area of nanoparticles as well as micron sized particles using nitrogen adsorption technique. Pressure can vary between 0 to 999 mmHg range. 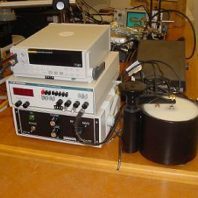 This DLS system with an APD detector is capable of measuring size and size distribution of nano-particles between 1 nm to 5 mm. 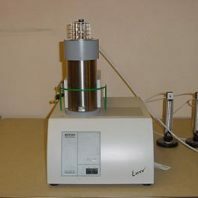 Suspension of particles in both aqueous and organic medium can be measured. This combined DSC-DTA-TGA system can run up to 1550o C under different atmospheres including static, dynamic oxidizing, inert and reducing atmosphere with a maximum heating rate of 50 oC/min. Depending on the material system, we can use either Pt or alumina crucibles for testing. Our single push rod dilatometer can operate up to 1550 C in different environment to measure strain within the material as a function of temperature. This data can be used to calculate coefficient of thermal expansion (CTE) or kinetics of sintering for particulate materials. The NETZSCH LFA 447 NanoFlash® is based on the well-known flash method. In this method, the front side of a plane-parallel sample is heated by a short light pulse. The resulting temperature rise on the rear surface is measured using an infrared detector. By analysis of the resulting temperature versus- time curve, the thermal diffusivity of various materials can be determined within 0.01 to 1000 mm2/s (thermal conductivities between 0.1 to 2000 W/m.K). It can complete tests on dozens of samples at room temperature in a single morning or, make measurements at temperatures up to 300 °C automatically. A 32 bit Windows® software package, combines easy handling and complex evaluation routines, thus offering a solution to almost every problem. More than 15 different evaluation models are available. 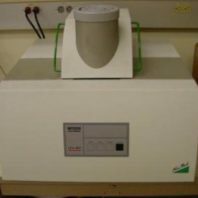 Mercury porosimeter can be used to measure size and distribution of open cell porosity in porous materials via change in electrical properties in the material due to high pressure intrusion of mercury. 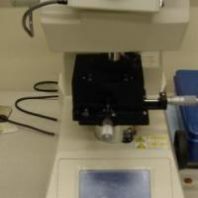 Our equipment is capable of going up to 33000 psi and can measure sub-micron and nano-scale porosity. Our HAAKE polylab compounding and single screw extruder system is capable of high shear mixing of polymers and polymer-ceramic composites for different applications. 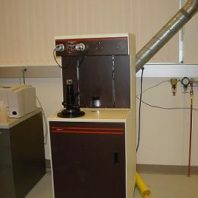 We also have tape and cylindrical dies for high temperature extrusion up to 400 C.
Our high temperature muffle furnaces can go up to 1700 C. It has a 6″ X 6″ X 6″ inner volume with 6 MoSi2 heating elements. CIP is used in ceramic processing to increase green density of ceramic parts. This machine can go upto 60,000 psi pressure. 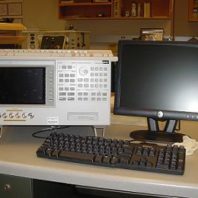 This new generation impedance analyzer can operate between 40 Hz to 110 MHz. We also have the impedance probe and dielectric measurement fixtures. 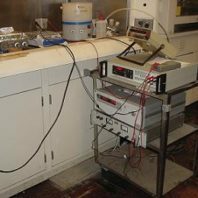 Our precision workstation with a HVI can measure electrical properties of thin and thick films up to 4 kV. These measurements include hysteresis in piezoelectric materials, I-V and so on. 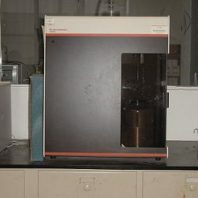 The lab is equipped with Shimadzu’s AG-IS Autograph ® (Shimadzu Scientific Instruments, Columbia, MD) table-top universal material testing system having 50 kN capacity. The machine is capable of testing various materials in tension, compression and bending. The TRAPEZIUM-X software enables to control various test parameters and even low cycle dynamic testing. Data processing in the software is very simple enabling direct calculation of desired mechanical properties such as tensile strength, yield strength, Young’s modulus etc. from the test results. 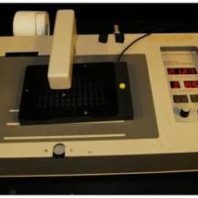 Shimadzu’s HMV-2T series microhardness tester (Shimadzu Scientific Instruments, Columbia, MD) has automatic load change function with 9 different load to select from. The tested is equipped with Vicker’s diamond pyramid indenter. The automatic operation eliminates operation errors and provides outstanding safety. The superior user interface with LCD touch panel makes the operation simple and easy. 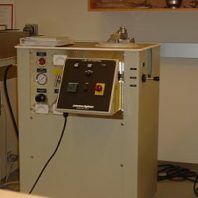 NANOVEA wear testing equipment (Microphotonics Inc., CA, USA) contains accessories to carry out the test in controlled atmosphere such as physiological/lubricating fluids with precise temperature and humidity control. 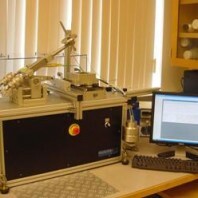 The instrument also has the capability to test the materials for their wear resistance in linear reciprocating and rotating mode with ball-on-disc or pin-on-disc configuration. The software enables independent selection of various test parameters such as load, speed, distance, temperature, etc. Cell culture hood is a carefully enclosed bench designed to prevent contamination of biological samples. 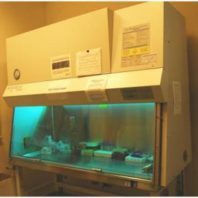 The cabinet is equipped with laminar air flow system along with a UV germicidal lamp to sterilize chamber when not in use. 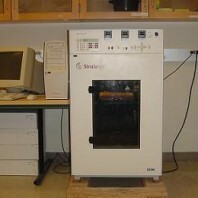 A CO2 incubator is an apparatus used to grow and culture the cells. 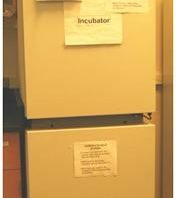 These incubators work to control three essential variables related to replicating the mammalian environment; stable CO2 level, temperature, and relative humidity (RH). 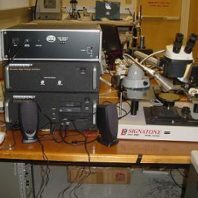 Fourier Transform Infrared Spectroscopy (FTIR), is a analysis technique that provides information about the chemical bonding or molecular structure of materials, whether organic or inorganic. Unlike SEM inspection or EDX analysis, FTIR spectroscopy does not require a vacuum, since neither oxygen nor nitrogen absorb infrared rays. 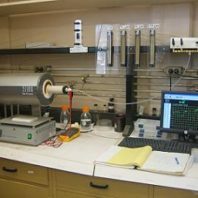 FTIR analysis can be applied to minute quantities of materials, whether solid, liquid, or gaseous. 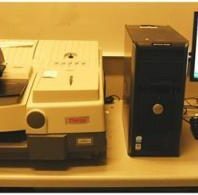 When the library of FTIR spectral patterns does not provide an acceptable match, individual peaks in the FTIR plot may be used to yield partial information about the specimen. 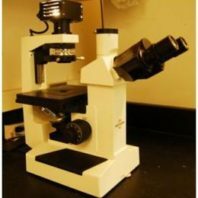 The inverted tissue culture microscope is used for biological applications such as to view tissue culture specimens grown in flask. Microplate Readers is used to detect biological, chemical or physical events of samples in microtiter plates. 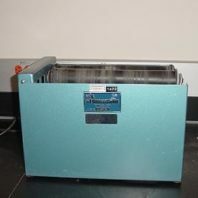 The microplate used is 96-well (8 by 12 matrix) with a typical reaction volume between 100 and 200 µL/well. Absorbance detection is used for assays such as protein and enzyme activity assays (i.e. in the MTT assay for cell viability). 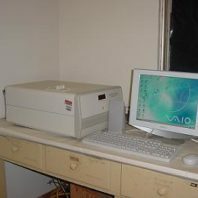 A light source of specific wavelength (selected by an optical filter, or a monochromator), illuminates the sample and the light transmitted through the sample is measured by a detector located on the other side of the well measures. The amount of transmitted light will typically be related to the concentration of the molecule of interest. 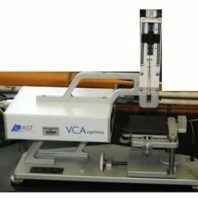 VCA Optima, AST Products Inc. 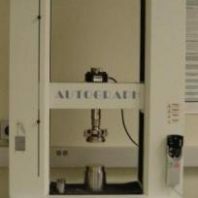 The static contact angles of sessile drops of liquids on polished samples can be measured using a face contact angle set-up equipped with a camera. The contact angle data is used for surface properties analysis such as wettability, surface energy, surface tension etc. 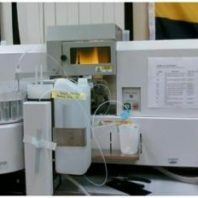 Atomic absorption absorption spectroscopy (AAS) is one of the commonest instrumental methods for analyzing for metals and some metalloids. 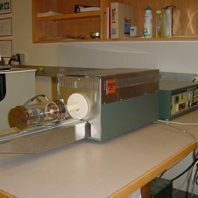 AAS uses the absorption of light to measure the concentration of gas-phase atoms. Each metal has a characteristic wavelength that will be absorbed. The sample of interest is aspirated into the flame and the metal atoms absorb some of the light, thus reducing its intensity. The analyte concentration is determined from the amount of absorption.